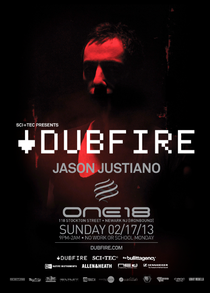 Grammy winning DJ/producer Dubfire, will be playing New Jersey with a rare appearance in the Garden State outside of the Big Apple. The Sci + Tec head honcho hits Newark’s One18 Lounge on Sunday February 17 and due to New Jersey’s time constraints, doors will open at 9pm. Widely recognized as one of electronic music’s most versatile artists, Dubfire initially brought a pioneering sound to the masses during his days as one-half of the distinguished DJ & production duo Deep Dish, which led to a catalog of dance classics, a Grammy for remixing Dido’s ‘Thank You’ and numerous international awards to their credit. His early solo productions came in the form of a string of releases including ‘Ribcage’, ‘Roadkill’, ‘Emissions’ and ‘I Feel Speed’. After more than twenty years behind the decks and in the studio, Dubfire continues to make his mark on the future of electronic music. For tickets, click HERE. Enjoy ‘Roadkill’ again below, we don’t need many reasons to feature such a top track!